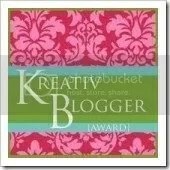 A huge thank you to jamarattigan for the Kreativ Blogger award. I feel honored, especially because my blogging consistency is spotty at best. Tonight, I blog as I’m about to enter my 38th year. I know. Just a baby you say and in some ways I know you are right. Jama says that this award entitles me to share seven things I love. She also says that I can be "kreativ" so in light of the new president and his call to service, I present seven ways to give. Giving is one thing I love. 2. Share your knowledge with others who are new to your area of expertise. You’ll find that as much as you give in this area, you will undoubtedly receive new friendships and unexpected knowledge. A huge thank you to kellyrfineman for her awesome poetry posts. I’ve learned so much from them. 3. Do Pro Bono work. It is difficult to say how much to give in this area because ultimately, you want your work to be compensated fairly. However, building a base of people who know and respect your work is money in the bank, and recommendations on the website. (I know, I haven’t updated mine in a while.) I find this to especially true of school visits. Teachers talk to each other. 4. When in doubt, give food. When I had my first child, my friends gave me dinners to freeze. This was the best thing they could do. If you are willing to organize such an effort, more power to you. If not, fire up your crock pot and invite a friend over for a meal. Or freeze your leftovers for someone who needs the extra time at night. 5. Give when others are done giving. As previously mentioned, when I had my first child, my friends gave me dinners to freeze. When I had my second child, everyone figured I knew what I was doing. That’s when I needed their help the most. Ask for help when you need it. 6. Give to the people closest to you. You’re probably saying that you do this all the time. Laundry, dinners, rides, support. Sheesh how much could you possibly give? I can only speak for myself and unfortunately, I’ve been giving my family a lot of "not now’s" and "why can’t you just’s" and "I’m busy’s". That’s okay sometimes, but sometimes I need to stop and give them a hug, a story, and attention. 7. Don’t forget to give to yourself. Time. A pat on the back. The permission to celebrate you. An hour to exercise. A nap. It’s all good. There’s my seven with this addendum. Give honesty and honestly. Hope it wasn’t too hokey and sappy. Posted on January 24, 2009 by Anna E. JordanPosted in UncategorizedTagged about me, giving. Previous Previous post: Oh Happy Day.